While waiting for the light to change, I pulled up alongside an older woman driving an antique blue Plymouth Valiant. 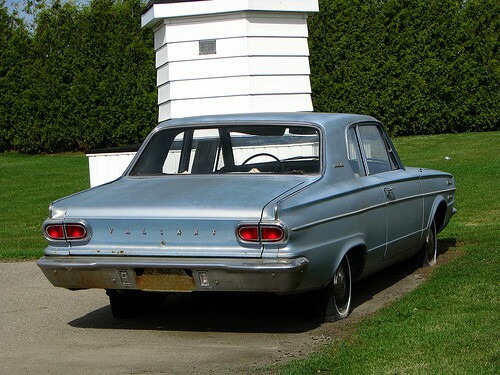 My first car was a turquoise Valiant. I wondered if this one, too, had the cool push buttons for neutral, reverse, and drives 1, 2, and 3. The light changed, and I let the Valiant pull ahead. Years faded away like paint. When I drove my old Valiant through the neighborhood with the windows down, (it didn’t have air or a radio), the world was a quieter place. Many women were stay-at-home-moms. No car alarms blared, no ATV’s roared, and no cell phones interrupted. I was free to drive in silence, to think, imagine, and plan. My big worries then were how to wrap angora around my boyfriend’s class ring, who would be at Friday night’s football game, and which station had gas for less than $.25 a gallon. My hair was swept up in a ponytail instead of permed, dyed, gelled and/or scrunched. I drove my girlfriends to the root beer or ice cream stand and ordered a frosted mug or chocolate shake, not worrying about carbs or calories. When I said, “My aching back,” I didn’t mean it literally and “necking” had nothing to do with keyboard strain. Ah, yes. Back then a person could just turn the TV dial rather than sort through the three remotes trying to figure out which one will do what I want. My favorite show was Marlo Thomas’ “That Girl”. I attended slumber parties where we watched TV for hours, drinking cherry Kool-Aid, giggling, and picking at our split ends. When the clock struck midnight, the station played “The Star Spangled Banner” and the screen grew fuzzy. The world was better at shutting down in those days. When I drove the Valiant, no one had wireless communication devices in their pocket. A mouse was something that made a nest under the car hood unless my dad sprinkled mothballs inside, blackberries were edible, and viruses didn’t send people to the technology department but to bed. The woman driving the Valiant put on her turn signal. No! I wanted to shout. Don’t go! When I was driving my Valiant, the only terrorist in my life was my adolescent brother. When bombing was mentioned, it meant my dog had brought fleas onto the living room carpet again, and we needed to fumigate. What shocked the world was the gyrations of Elvis’s hips and the length of the Beatles’ hair. Ah, let me put on my pedal pushers and once again get behind that wheel. Previous StoryMy Purse: Mirror To the Soul Or Where the Heck Are My Car Keys?